Lord Ashcroft remained a non-dom, and continued to avoid tax despite attempts by Parliament to make peers pay their full share, leaked documents reveal.The peer was domiciled for tax purposes in Belize at a time when it was widely believed he had given up the status, the Paradise Papers show.While ordinary Britons have to pay tax on everything they earn, non-doms are only taxed on their UK income.Lord Ashcroft, who donated millions to the Tories, said he would not comment. He said it was because of the way he had been treated by BBC Panorama in the past. When questions were raised about his non-dom status in 2010, he denied any "impropriety or wrongdoing". 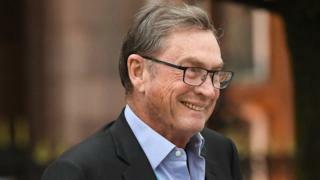 A former party treasurer and deputy chairman, Lord Ashcroft fell out with David Cameron in 2010 and later co-authored a controversial unauthorised biography of the then prime minister. But the 71-year-old remains involved in UK politics through his polling and publishing interests and last year said he would start donating "smaller sums" to the party again. Parliament tried to force the controversial peer to pay full British tax when he entered the House of Lords in 2000. Lord Ashcroft promised to become a permanent resident in the UK - a change that would have meant giving up his status as a UK resident whose permanent home, or domicile, is outside of the country. The then leader of the Conservative Party William Hague told Parliament that becoming a peer would "cost him [Lord Ashcroft] and benefit the Treasury tens of millions of pounds a year in tax". Lord Ashcroft's admission in 2010 that he was still a non-dom led to a major political controversy and the introduction of legislation designed to force anybody who sits in Parliament to pay full British tax.After Lord Ashcroft told the BBC in May 2010 he was going to become "a fully taxed person in Britain", it was widely reported he had given up his non-dom status. The Conservative Party also gave such an indication on 7 July that same year. However, documents seen by the BBC's Panorama, reveal "his true domicile is Belize".The new law, the Constitutional Reform and Governance Act, had not specified that non-dom MPs and peers would have to give it up the status - only that they be "treated as domiciled in the UK" by the tax authorities.It meant Lord Ashcroft had to pay full British tax while he sat in Parliament, but as soon as he resigned from the House of Lords in March 2015 he was also a non-dom again in the eyes of UK revenue inspectors. The Paradise Papers suggest Lord Ashcroft worked around the new law to continue avoiding tax on his worldwide income between 2010 and 2015.On the 31 March 2010, the day before the new law came into effect, Lord Ashcroft's offshore trust bought shares worth ?33.9m from one of his companies.His advisers note that the deal has "capital gains tax implications" but they point out he is "not domiciled in the UK at the moment".If the deal had happened the following day, he would have been treated differently and could have been liable for capital gains tax.While he was sitting in the Lords as a full British taxpayer between 2010 and 2015, Lord Ashcroft appears to have stopped taking payments from his offshore trust. One of his advisers notes "that there is no applicable tax as there is no distributable income".The accounts for the trust show Lord Ashcroft didn't receive any payments in 2011, 2012 or 2013. The accounts for 2014 and 2015 were not in the leaked documents.Lord Ashcroft announced his resignation from the House of Lords in March 2015. A week later, he sold shares worth ?11.2m.If he had still been sitting in Parliament, he would have been liable for capital gains tax on any profits from the sale. But Lord Ashcroft was being treated as a non-dom again and could legally avoid the tax.Journalist Peter Oborne says Lord Ashcroft's non-dom status was a "huge issue" at the time he started to sit in the Lords and there was "fresh controversy" when the Tories entered power in 2010.The revelations in the Paradise Papers could cause a "major political explosion," he said. "The Labour Party... will turn it into a first class political row. It will raise huge questions about not just the Conservatives [but] also the House of Lords. "The Conservative Party did not respond to the BBC's request for comment.